Leading off today: Nothing lasts forever, though it certainly took awhile for that message to reach the Pearl River girls cross country team. Tappan Zee defeated the Pirates 27-30 on Tuesday as part of a triangular meet, ending Pearl River's winning streak in dual meets at 221 dating back to a Sept. 18, 1990 loss to Nanuet. Pearl River's streak was the presumed national high school record for girls. The National Federation's record book lists only a string of 133 wins by Ridgewood (N.J.) from 1983-2004. The New York State Public High School Athletic Association lists a streak of 174 wins by Victor as the previous record. Pearl River, which had won 86 in a row prior to its 1990 setback, was ranked fifth and Tappan Zee eighth in Class B this week by the New York State Sportswriters Association. Pearl River also boasts of a 193-meet winning streak in girls outdoor track that was snapped in 2014 with a loss to Albertus Magnus. Mary Borkoski of Pearl River hit the tape first in Tuesday's meet with a time of 17:17.8 for 2.5 miles. Tappan Zee's Alexandra Thomas (15:24.8), Tori Fears (16:03.9) and Maddy Roth (16:08.1) were next across the line to set the stage for the win. Boys soccer: Brentwood and William Floyd played to a 1-1 tie in a matchup of two top teams Class A from Section 11. Brentwood is ranked No. 1 and William Floyd 19th this week by the NYSSWA. Brentwood senior Johnatan Mendoza-Yanes forged the tie with a goal with eight minutes to go in regulation. Gio Fiore put William Floyd ahead four minutes before halftime with a blast off the crossbar on a feed from Elvin Carranza. "It's good that we got the away point," Mendoza-Yanes said. "We came back even stronger, had chances, opportunities, but we were a little unlucky there." Back in top form: Pioneer senior Meghan Root reached the 100-goal mark for her soccer career Monday with a pair of goals vs. East Aurora. She has bagged 20 goals to go along with five assists in the first six games this season. This all comes after Root, who will play for Syracuse University next season, had to miss the 2016 season due to surgeries that corrected issues with her hip, adductor muscles and labrum. every training session just means more." 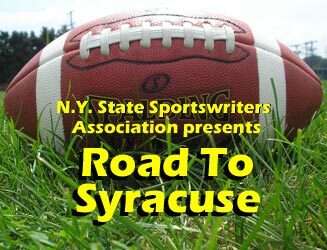 Rankings progress: The NYSSWA released its first set of football rankings for the 2015 season today, with the five reigning NYSPHSAA champions holding down No. 1 spots. Links to weekly rankings for football, soccer and cross country can be found here. Deep South dust-up: This weekend's football faceoff between Trinity Christian-Cedar Hill of Texas and Louisiana power Evangel Christian has been canceled because the Texas school says it received poor quality game film in the scheduled film exchange over the weekend. Evangel Christian chancellor and offensive coordinator Denny Duron termed it a glitch. "We sent them the wrong footage, and it put them behind in their preparation," Duron said. "Those coaches don't know our coaches, so it seemed like we were disrespecting them, and that wasn't the case. ... It was an honest mistake. But I totally understand why they felt that way." Trinity Christian's offensive coordinator is former NFL star Deion Sanders. Extra points: Chris Battaglia, who stepped down as head coach at Aquinas after the 2016 season with four NYSPHSAA championships on his resume, is serving as the defensive coordinator at Irondequoit, ranked 13th in the state in Class A this week. The Eagles play No. 9 Canandaigua in Week 3.